What does Leonardo da Vinci have to do with salt? Quite a lot if you are in the city of Cracow. If you have already crossed Paris and Venice off your travel list and you are still looking for an interesting European destination, you may want to check out a place that combines safety (a premium feature when compared to London these days) with a true Old World charm. Cracow is as beautiful as Prague but much less known, while still boasting of a trove of world-class art treasures. It is an old capital of Poland (kings ruled from there between 11th – 16th c.) where you can visit some of the oldest and most beautiful architectural treasures: a Gothic St. Mary’s Ascension Church with a huge medieval wood – carved altar, a Royal Castle of Wawel, as well as one of the oldest universities in Europe. And, at the National Museum, you can also find a Leonardo da Vinci painting that is probably the most magnificent portrait he ever painted (sorry, Mona Lisa!). It is called Dame with Ermine and it is as breathtaking as it is relatively unknown. Da Vinci painted it around 1489. It is one of Leonardo’s fifteen pictures that survived till our times and one of a handful of portraits. This one portrays Cecilia Gallerani, a mistress of Ludovico Sforza. At the time, Cecilia was pregnant with Sforza’s son (the ermine she is cradling conveniently covers the the bulge), and the painting served as a hidden declaration of their love. Sforza was in the middle of a negotiation to marry Beatrice D’Este and his love tryst had to stay secret. 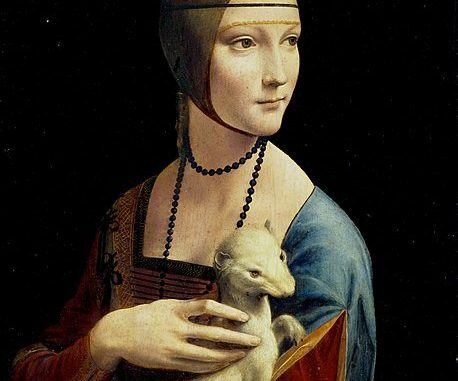 The lovely white ermine that makes the painting so unique carries therefore a hidden message – its Italian name “ermellino” alludes to both Gallerani’s name and Sforza’s nickname. In a typical portrait the sitter would look straight at a viewer, but Cecilia and her pet are looking “off-screen” toward a third person in this artistic dialogue – presumably Ludovico who would be watching the picture being painted. There is a whole love story here, told in glances and hints; a vibrant image of an Italian beauty with a signature mysterious smile we know so well from the other da Vinci portrait. The painting’s fate for the subsequent 300 years was unknown until it was acquired in the 18th century by prince Adam Czartoryski and until last year it was in the possession of this old, aristocratic Polish family. Dame with Ermine has also a dramatic history that reflects a tumultuous history of Poland. The Czartoryski family had taken it out of Poland during one of the uprisings against the Russians in 1830 and brought it back home fifty years later to create an art museum. As soon as Hitler invaded Poland in 1939, the painting became a spoil of war and it was appropriated by a Nazi governor of the region. Towards the end of WWII it was taken away to Germany and it returned to Cracow in 1946. There are some movies and books (including Richard Harris’ Fatherland and the movie Monuments Men) that mention this painting and how close it was to being completely lost. You can also check out Raiders of the Lost Art documentary show, currently on Netflix. Last year, in order to prevent a future sale to a private collector, the Czartoryski family decided to sell the painting and the rest of their collection to the nation of Poland. It was sold for a very diminished price of 100 million euro (an insurance value of this painting alone is at least three times that sum). However, what makes Dame with Ermine so exceptional is not its commercial value but the sheer genius and beauty of the painting, and the fact that only five female non – religious portraits by Da Vinci are known. Dame with Ermine is well worth a visit to Cracow. And if you happen to be in Cracow, there is another rare wonder to check out: Wieliczka Royal Salt Mines. Many things were once a source of wealth: camels, colored beads, saffron, and so on. Salt used to be one of them. Since antiquity salt has been treasured, gathered and traded. For millennia salt preserved food for winter, provided tastier dishes and it also moved civilizations along when used to make gunpowder and paper. It was also scarce – in some regions of Asia and Africa it could be gathered from dried lake beds but in Europe it would be often be mined. Cities such as Salzburg (i.e. City of Salt) and Venice rose to prominence thanks to the salt trade. One of the best European salt mines from Middle Age onwards was the one in a small town of Wieliczka near Cracow. In the 14th century the income from Wieliczka salt constituted 1/3 of the Polish royal treasury. Salt is no longer considered a king’s treasure but Wieliczka is still open for business – the only mine in the world that has been in continuous operation since Middle Ages. It is now a museum rather than an active plant and it is truly a fascinating place. You start by going 200 feet underground to visit the first level of corridors and chambers. Everything there is carved out of salt. All visiting kids end up licking the walls to test it but they do have a good reason – it is truly a wonder to discover that walls aren’t stone rock but sheer blocks of grey salt. In the center of the mine there is a chapel… you guessed it… carved out of salt as well: huge chandeliers, the altar, figures of saints and all the walls, the ceiling and a tile – patterned floor. The Chapel of St. Kinga is open for sightseeing, daily masses and weddings. There is also a spa with treatments for respiratory ailments, an underground lake and dioramas of old mining techniques. UNESCO designated this place a World Heritage site – you will not find anything like it anywhere in the world. Wieliczka is only a 20 minutes’ bus ride from Cracow so if you are there checking up on Da Vinci’s masterpiece, check Wieliczka salt mines out as well.